Joining a new sports club can be daunting. What exactly is on offer? How does it all work? How do I meet other players, especially those of similar ability to me? LSTC offers an Induction session to welcome all new adult members to enable you to get to know the club. 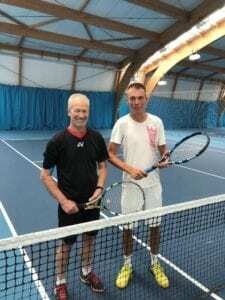 The aim is to explain everything we have on offer at the club and more importantly, to point members in the direction of those sessions best suited to both their current ability and their ultimate tennis aims. These can include everything from social play at all levels, group or individual coaching, internal and external competitions, drills and cardio tennis. It also provides an opportunity to meet other new members. New members can choose to attend one Induction during any of the first three months of their membership. You must be a member to attend – this is not a taster session. We also ask that individuals inform Reception if they are intending to come to an Induction, but it is not compulsory to do so. Inductions are run by coach and current Men’s 1st team captain Ben Wilsher, and long-standing member Bob Press. "We look forward to seeing you there"